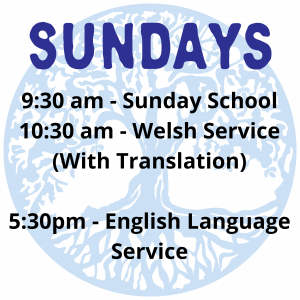 There are two services every Sunday: 10:30am in Welsh, and 5:30 in English. The services vary slightly but aim to bring glory to God through teaching the Bible, and through growing together as disciples in a loving, Christ-centred community. 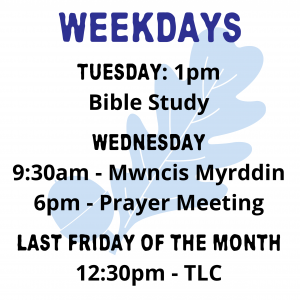 Everyone is welcome, we’d be delighted if you joined us at Penuel. 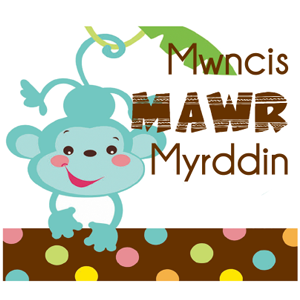 The Welsh service is for everyone of every age, with simultaneous English translation. During the service, there is a crèche area for babies, and a Sunday school for older children. We enjoy tea and biscuits and an opportunity to get to know each other following the service. The English service is at 5:30pm. We enjoy fellowship together as we delve deeper into the Word of God.